I was going through some old things that I never unpacked when I moved to a new apartment last summer. 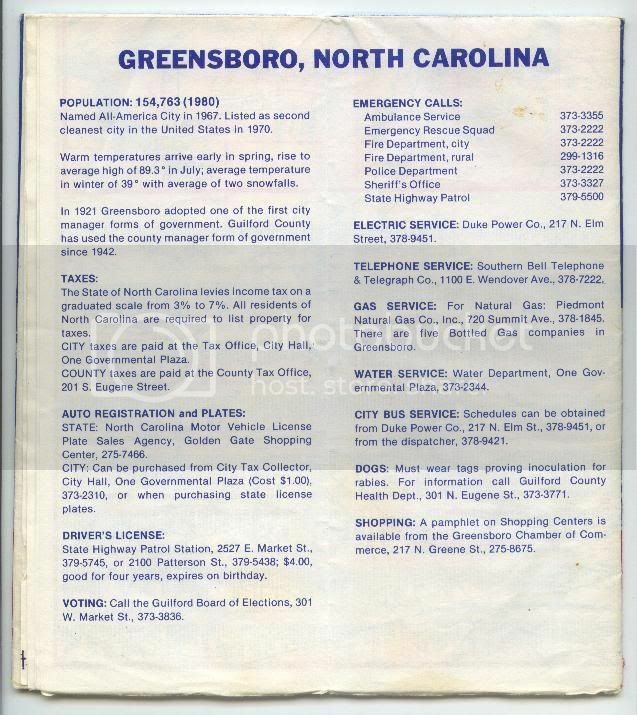 One of the items was an old Greensboro map that I collected from my Grandfather after he died. 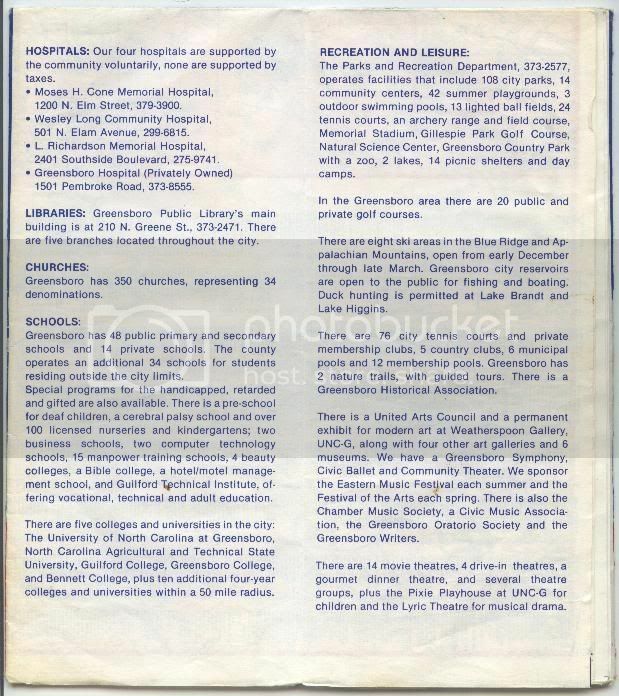 The map is dated 1984, and I've scanned the cover as well as the city information section. The map itself is of course too large for my scanner, however it is really fascinating looking at the layout of the roads, the fact that PTI wasn't PTI, I-40 ended at Greensboro, and the 6 lane I-85 bypass we all know and love around High Point and Lexington is listed as "Under Construction". I love retro maps. I have a North/South Carolina Esso map from 1972 and it's extremely interesting. For one thing, "Preddy Blvd" at Death Valley was known as "Crescent Blvd" back then. I was two years old when that map was made. prices have gone up on maps. I know a city map (not the city made ones) can cost above $3 today. It is fascinating to look at old maps... Ive been buying them since the the 80's and since I never throw away maps.. I guess that makes me a collector. 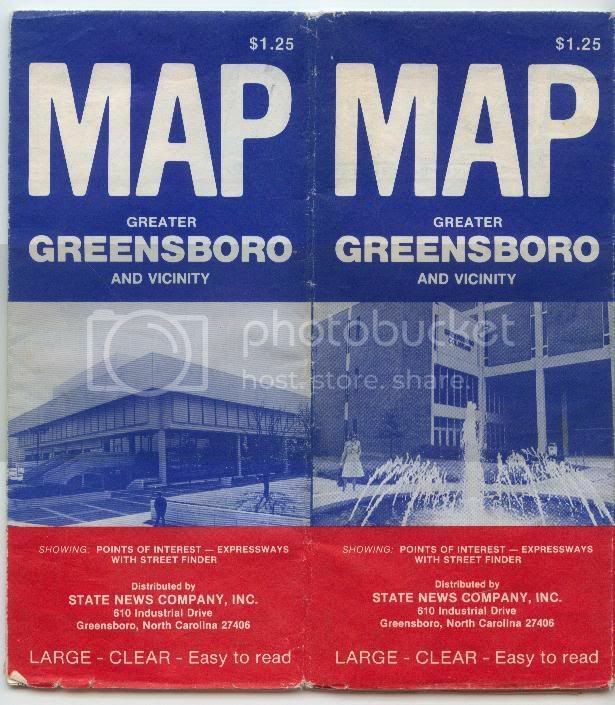 Now I am tempted to dig into the closet and find all my 1980's maps of Charlotte, Greensboro, and Rand McNally US Maps. Ditto - occasionally I'll find some in used bookshops; I've managed to find several old (1950s-80s) maps of some NC/SC cities - Columbia, Charlotte, Asheville, Rocky Mount, Winston, and a few other cities elsewhere in the US (Pittsburgh, Columbus and a few places in California). The old ones - before about 1990 - featured hand-drafting that looks surprisingly antiquated now; and I have several old Charlotte maps (and a Winston from 1961) that were glued into a fold-out cardboard cover, which is kinda odd, like some European maps. I think most of those were published by companies that aren't around anymore - Champion and Arrow mostly. Now they look a lot more digitally-generated. I'm guessing Cityboi works for Map Supply? I have those and ADC - Alexandria Drafting - maps in the car; I drive between the Triangle, Triad and Charlotte fairly often, and they cover all 3 areas thoroughly.